'Jerusalem is Israel's capital, that's where our embassy should be.' Governor Rick Scott calls on President Trump to transfer US embassy. 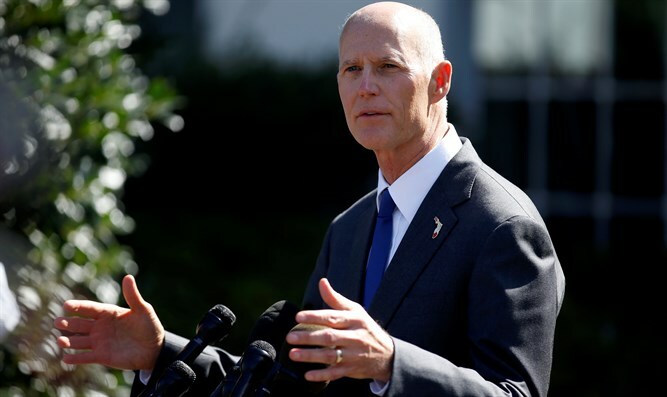 As President Trump weighs the possible transfer of the US embassy in Israel from Tel Aviv to Jerusalem, Florida Governor Rick Scott called on the president to make good on his 2016 campaign promise to move the embassy. The Trump administration missed two deadlines for extending a security waiver which permits the embassy to remain in Tel Aviv, Israel’s second largest city, despite a 1995 law requiring the facility to be relocated to the Israeli capital, Jerusalem. Under the 1995 Jerusalem Embassy Act, passed by a wide, veto-proof bipartisan majority during President Bill Clinton’s first term, the embassy must be moved to the Israeli capital. Implementation of the law may only be delayed if the president signs a waiver granting a six-month period to make security preparations for a future move. Every president since Clinton has used the waiver clause to avoid implementation of the law for the past 22 years, skirting the requirement to transfer the embassy. President Trump has signed a single waiver since taking office, pushing off the embassy move on June 1st of this year. That waiver was originally slated to lapse last Friday, though the White House announced prior to the expiration that the president would address the issue after the weekend. Yet the new deadline, set for Monday night, passed with neither a new waiver nor a declaration by the White House regarding the future of the embassy. Foreign leaders, including France’s Emmanuel Macron, have called on the president not to change the status quo regarding US policy on Jerusalem, urging him to neither relocate the US embassy nor officially recognize the city as Israel’s capital. Some senior Democrats, including Democratic National Committee deputy chairman Keith Ellison slammed the possible recognition of Jerusalem as Israel’s capital, calling it a “horrible tragedy”. Even some US officials have been pressuring the president behind closed doors not to change policy on Jerusalem. But Florida’s Republican governor, Rick Scott, endorsed the embassy move, saying it was time for the US to implement its own law and to recognize Israel’s capital. “It’s the capital of Israel, our embassy ought to be located there,” Scott told The Jerusalem Post at Tel Aviv University on Monday. The governor said he backed the embassy move – even if President Trump alters his position on the matter. Scott also spoke out against the Boycott, Divestment and Sanctions movement working to delegitimize the Jewish state.